Special Needs Summer Camp - Who is Teaching Who? Synopsis : At summer camp special needs students teach us about the important things, innovation, persistence, courage to overcome obstacles, joy, laughter, patience and compassion. "Some people look at individuals with disabilities and think, 'Oh, we're going to have to help them a lot.' The result is actually the opposite," said Maddie Ashcraft, seven-year summer camp instructor. Ashcraft says her students have taught her more than she has ever taught them. "Children facing challenges have a lot to give - they are the teachers," agreed Jack Viorel, Ashcraft's camp mentor and founder of nonprofit Indo Jax Surf Charities. "With each summer camp, special needs students teach us more about the important things - innovation, persistence, courage to overcome obstacles, joy and laughter, patience and compassion." Kim Kredich, mom to three children, one of whom is on the autism spectrum, describes the summer camps as "so refreshing." 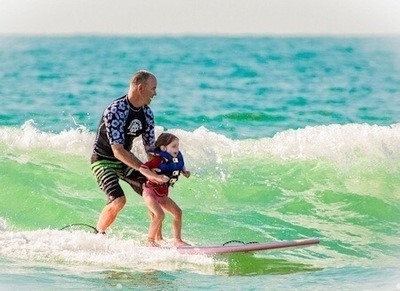 During the weekend of May 25-27, Kredich will bring families from Knoxville, Tennessee, to Wrightsville Beach, North Carolina, for a new and inclusive Indo Jax Surf Charities experience based at Blockade Runner Beach Resort. "Ten of the 27 children coming have disabilities. The other 17 do not. They will learn to surf right alongside each other," Kredich said. "When we are inclusive and help each other, we all learn and benefit," said Viorel. "The teachers become the students and the students become the teachers and the world becomes a better place." Viorel began his teaching career 25 years ago in a classroom with medically fragile, special needs, and at-risk kids. Ten years ago he moved his family to Wilmington, North Carolina and opened a surf school as a means to reach children and open their minds. The new inclusive camp is the first on a summer-long schedule of charity outreach surf camps that will serve - at no cost to the campers - visually impaired, autistic, and hearing impaired individuals, as well as boys and girls club members, wounded soldiers, cancer survivors, and participants with developmental and intellectual challenges. "No one is born with a limiting belief. Limiting beliefs are learned and taught," said Viorel. "When we stop putting limiting beliefs on a special needs child, the sky is the limit. Our goal is to help a child shed limiting beliefs and uncover their confidence and self-esteem again." "To find an experience for your kids where you don't have to battle, where your kids can relax and learn something new, where - as a parent - you don't have to wonder whether they're being taken care of and having a good experience - well, that just doesn't happen very often," said Kredich. Kredich said the camps are an important example for schools and other institutions when it comes to inclusion. 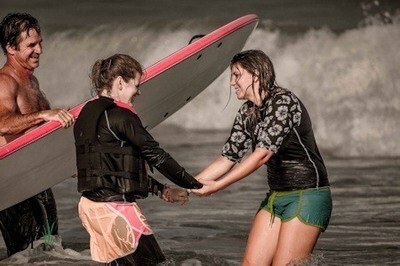 "If a surf camp can manage full inclusion, nobody else has an excuse to leave anyone out," she said. In addition to the free special needs summer camps, Viorel includes anyone with disabilities into the regular surf camp schedule with no additional fee. "I'd love it if everyone signed up whenever they wanted to come," said Viorel. "Right now, though, those special weeks provide peace of mind for families trying this for the first time."